What is the strut mount? The strut mount is the part that connects the strut to the vehicle body. It usually consists of two steel plates separated by a rubber insulator. The strut is mounted through the steel plate. A bearing is used in many Strut Mounts to provide a smooth steering response. 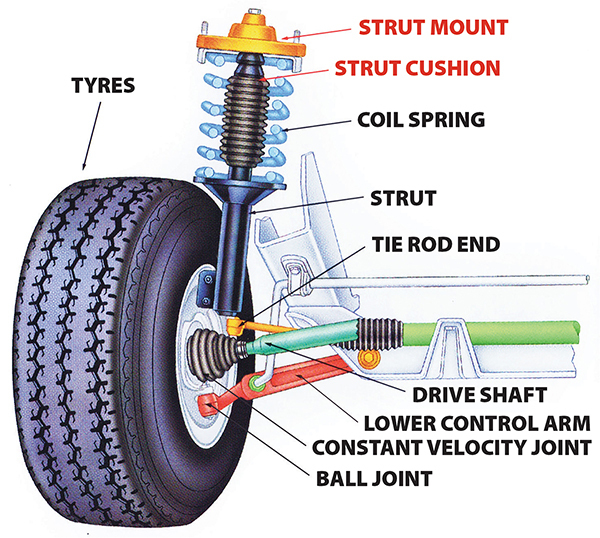 What is the function of the strut mount? It acts as an additional shock-absorbing device to help eliminate unwanted suspension travel. It assists in keeping the vehicle on a straight and level path under hard braking and acceleration. It aids in eliminating body sway when corning. How do I know when to replace the strut mount? Strut cushions prevent metal-to-metal contact between the strut top and the mount. The dust cover protects the strut piston rod from dirt and moisture. Gabriel strut cushions are made to OE quality and style and the range includes products for most vehicles in the Australian carparc.